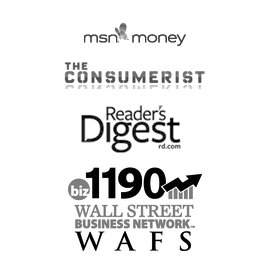 Jessica Streit is the owner of The Debt Princess and a staff writer for Moolanomy Personal Finance. Moolanomy.com is an online personal finance blog aimed at helping its readers gain control of their finances, earn more, spend less, and live better. About two days ago, I pitched an idea to Andrea to host this blog post. I suggested a post about using coupons since I knew that she didn’t really write about them. I figured we could be helping each other out. She’d get a great post on content that she isn’t too familiar with and I would be able to fulfill a client’s dream to post at So Over Debt. I literally stated out loud, “Who hates coupons?” I mean they can save you money on your grocery bills with very minimal work and just a little bit of planning. They aren’t hard to use and they are readily available. But then I read Andrea’s post about her feelings on using coupons and I was stumped. Confession #1 – I actually agree with Andrea on a few of her points! This surprised me. I love to use discount coupons! I love saving money on my grocery budget. I love trying new items that I wouldn’t normally try because they are usually too expensive. But there are some points in Andrea’s post that resonated with me. After years of being an avid coupon user, I have to admit she is right about a few things. Confession #2 – I once had a ten year supply of dishwasher detergent. It’s true. In 2007, my supply was so great that it filled multiple tubs (they are the little gel packs that you drop into your dishwasher compartment) in my basement. When I moved (and I have moved with them twice) I gave a huge amount to my family members who helped. I have given a friend of mine months worth of dish washing tabs a couple of times as well. And I still have at least a couple of year’s worth of supply in my stash. At least now, it’s down to just one, easy to carry tub. I never took a class on how to organize coupons but I have spent more money than I should have finding an approach that worked for me. I had the small accordion folder, I used a file box (you do not want to drop a file box in the middle of the grocery store, trust me), a large bulky binder and eventually a more manageable system that works for me. 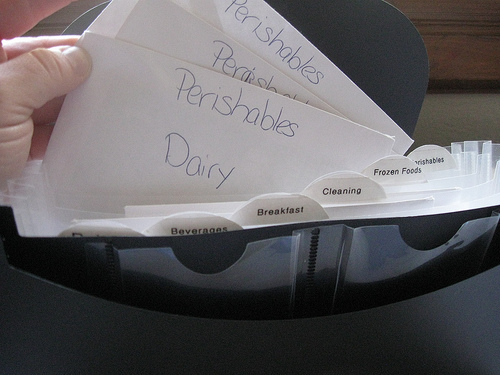 Confession #3 – I’m actually quite proud of the way I organized my coupons and I think everyone should be using it. I have it organized in such a way that I can get out of the checkout lane without drastically disturbing those behind me in line. I frequently let those with less items in front of me before I check out. I am certain that my coupons are being used in the exact way that they should be so that they do not cause a problem for the cashier. I have separated an accordion file folder into categories and then placed envelopes into each category with sub-categories in them. For example, I have the Perishables spot and in it there are envelopes for produce, dairy and meat. Staying organized at the check out and in the store helps me and keeps me from being a reason for others to complain. Confession #4 – I once got very close to becoming an out of control extreme couponer. It was scary for awhile. I literally felt like I needed to find the best deals and I needed to buy as much of them as I could. I learned my lesson rather quickly but I can understand how it can become an obsession for others. It is just like impulse shopping or other addictive behaviors. You can get a rush of adrenalin when you find a great deal. I believe that those who feel that way probably could become addicted to any number of behaviors. And much like hoarding, it becomes completely mental. While I think that coupons are an excellent way to reduce your grocery bills and they should be used by everyone who is trying to cut back on expenses. I think, just like so many other things in life, that moderation is key. I have drastically cut back on the amount of coupons I use for a couple of reasons. First being my health. I have changed the way I eat and the foods I eat have fewer coupons available (I’m Gluten Free and about to make the move to Vegan as well). Another reason is that I do not have the space in my apartment to store a huge stockpile. I do it in moderation now and it works for me. Whether it is with coupon usage, the speed at which you pay off debt or how committed you are to exercising, finding what works for you is the key to success. And if all else fails, write a humorous blog post about how you failed. Chances are, dozens of others have too but were too afraid to talk about it. From Andrea: You guys already know how I feel about coupons. While I would never dissuade someone else from using them, especially if they need them, I hate the way that it’s become “trendy” to coupon (and the fact that coupon is now a verb). I totally agree with Jessica’s assertion that you should do what works – if coupons are beneficial to you, by all means, buy all the binders you want. Just don’t expect me to use them! I'm not a huge coupon person either. I tried to use coupons awhile back, but it seemed like a lot of work. But when I did use them I saved a lot of money! @SenseofCents I think it can be a lot of work initially but then you find what works for you and it goes quicker. I use to spend hours but now, 1 hour tops! For me it's just another way I work to keep money in my wallet. I still haven't found a couponing system that works for me. At least not for grocery shopping. I'm a big fan of asking my doctor for coupons for prescription drugs. I would get $50 off coupons for one particular brand name drug I use which covers my entire copay for a 3-month supply. I used to buy a lot of daily deals too that'd save me about 40% (after factoring in tax and tip) on my restaurant bill. @Shawanda That's a great tip Shawanda. Prescription drug companies put coupons out all the time. I get a lot of my kids' OTC medications from coupons that I picked up at the pediatrician's office too. The drug reps leave them sitting out on a counter for us to grab. I have tried dozens of systems. I'm happiest with my envelope system. It's cheap and organized in a way that makes sense to me. I can always give you ideas if you need them. Just get in touch with me. I use coupons if I have them–yeah, that really makes a whole lot of sense. What it means, is that I'll go to my parents on the weekend and grab coupons for stuff that I know I use and will need. Then, when it comes time to buy the products, I'll use the coupons. I won't scour the web for them, and I won't join some crazy group trading coupons or weekend inserts or anything like that. For me, the amount of time it takes to save a little bit of money isn't always worth it. Plus, I pretty much use fresh produce exclusively, and there are never any coupons for that stuff. The only things I buy that have coupons associated are household goods, and for a single guy living alone, I don't need to buy so much that I can really make a killing hunting down coupons. @Eric J. Nisall – DollarVersity oh but there are plenty of produce coupons out there. You can get coupons from Driscols website. Cuties has them out when oranges and clementines are in season, Dole has coupons for fresh produce from time to time as does Sunsweet tomatoes. My grocery store sends me coupons for produce (spinach, lettuce, carrots usually) as well. It is possible. Coupons work for me if they come in the mail already (meaning I don't have to go buy a Sunday paper to get them) and if they are relevant to what I already would like to buy. If that's not the case, which it normally isn't, I go without coupons. I know some people like my sister switch stores all together because of coupons, but I don't do that. I do, however, look for the best deals while I'm at the store. I almost always buy what's on sale or the cheapest. Name brand groceries don't mean much at all to me. The only name brands I really care about are those in tea, coffee, cereal, frozen pizza, ice cream and a few others. Sometimes the cheap stuff is flat out horrible tasting. Another area where coupons work well for me if when other people give me their coupons from the Sunday paper. Oftentimes, that's where I can get the good deals on toilet paper, tooth brushes, tooth paste and all of that type of stuff. I love to save money on those things because that's an area where I don't settle for junk. I get the good stuff. @Kraig @ Young, Cheap Living I have someone who hands me a ton of coupon circulars each month and it's great (in fact, I can't even use all the ones I'm given because there are so many). I will use a coupon to try out a new product but then if I don't normally eat the item, I do not even bother to clip the coupon. I can't be swayed by $1 off something just because it's a good deal. Since I check my mail somewhere around 1-2x/month (yes my postal person probably hates me), clipping coupons has never really appealed to me. I've never seen coupouns for fresh foods either so most of my groceries are on me. Maybe if I wasn't lazy I'd look into coupons for the cat supplies. So much work though. My time is worth more than $.40 off my next purchase. @Rachel @ Read That Reviews I get a lot of produce coupons directly from my grocery store. They regularly send coupons out based on our spending habits. There are brand name companies that put out coupons for produce as well. I can think of Cuties, Driscols, Sunsweet tomatoes, Dole and I'm sure there are more. And you are right, if you were only saving 40cents, then it's not worth your time but if you use 10 coupons and saved $10.00 for less than an hours work, would that be worth it? I compare it to how much I bill clients. I get paid, on average $20 per hour. I can work on coupons for an hour and save far more than that in a week. So it's worth my time. @CanadianBudgetB Thanks! I wrote a post on How NOT to extreme coupon and one of my major points is that obsessive need to find the deals. I'm sure it doesn't afflict everyone but it sure got me. Probably those of us prone to some type of OCD. I shop alot online and almost always check for coupon codes on retailmenot. I also use ebates.com. For groceries I usually print coupons from swagbucks or coupons.com for the stuff we have to buy anyway (i.e. yogurt, cereal, cheese). I get a weekly email so it's open, click, print. It literally takes me seconds and every lit bit of savings matters since we both like working part time to be with the kids. @Jesort415 You are using great products. Ebates and coupon codes give you double the savings as does using swagbucks for coupons. Great job! We've gone through a lot of couponing phases. My wife generally spends about 2 hours connecting available coupons, with our needs and the circular sales. We generally end up "saving" some good money – average $30-$40 per hour of her work – from it. Then again, when we don't do it, just focusing on list and items on sale can take very little time and still save some money. We've definitely become obsessed at times, too…. @Nick-SAFTM after using coupons for awhile you start to notice the sales so even when you are in the store without coupons so you know what to skip. It's easy to avoid impulse purchases when you know you never have to pay full price for an item, right? The wife uses coupons for groceries, but she only spends about 10 minutes each week doing that. Saves some money but not a ton like on the extreme couponers show. When I shop online I normally do a quick google search for coupons. Might actually find one that works like 20% of the time. @DebtnTaxes wow, just 10 minutes? She's efficient. I spend maybe an hour and that includes the actual cutting of the coupons, matching up any sales and then organizing my trips. I'm in the middle. I think there's a balance between tens years of anything and say, a year's supply of toilet paper stuffed in a cabinet that has no other use. In a small apartment, the stockpiling makes less sense of course, maybe the third extra tube of toothpaste is already too much. I recently finished my basement, myself. I found that Home Depot honors Lowes coupons and they were available on eBay for under $10 for a pack of 5. I had about $5000 in expenses I used these on. I consider the minutes on eBay little compared to the $500+ I saved. I'll also glance at Sunday coupons and cut out the items we use already. By the way, CVS + coupon means never paying for a tube of toothpaste again. The key thing is to (a) not make a trip just for this, wasting time and gas and (b) don't obsess, it's ok to miss the deal whatever it is. Last – Costco issues their own coupon book. This cycle, the Maxwell House coffee was $3/lb after coupon. Compared to $7-8/lb in the store, this was a great stock-up item, esp in the 2.5lb cans. But again, we have the room in our pantry. The concept of diminishing return needs to be part of the discussion. It's too easy to go OCD and turn hours into pennies. @joetaxpayer I LOVE CVS!! I will never give up coupon usage at CVS. I haven't paid more than 50cents for shampoo (and I'm not talking Suave either) in years. I almost never pay for health and beauty products thanks to CVS. @The Debt Princess Another CVS lover here! I used to visit multiple drugstores each sunday after I got my coupons, but I find they have the best deals over all other chains. @GirlNDguideTF – For what it's worth, I was in CVS for other items but grabbed 12 bars of bath soap, my brand, $1 after extra bucks. They's have been $3, but two $1 coupons were sitting there as if the Big Guy(r) just left them. $5 saved and I spent no time even cutting the coupons. Tough to walk by that. @joetaxpayer That's amazing! I get deals like that at CVS all the time. I clip coupons every week but I'm not obsessive or a stockpiler – just get very excited when there's a good deal like the one you got! I tried to do the extreme couponing thing after the show came out. I even got the binder, spent like 6 hours on Sundays clipping coupons, organized… I got some free stuff at CVS a few times but my interest kind of fizzled after awhile. I sure gave it my best shot, though! @HousewifeEmpire That show drives me nuts. It's so very contrived. I met one of the guests on that show (Nate, he did the tower of cereal) and he explained about how much of it is prearranged. It's not authentic and it gives coupon users a very bad name, imo. I don't use coupons at all… I don't usually shop for kind of products that attract coupons, or at stores that offer them, so it just wouldn't make sense to even try couponing. Rebates are even worse, I tried them twice and I stopped! at the beginning it seems that I will get a 50$ gift card but they make it so hard that you don't want to even apply for it, so much hassle!